The Aqua-Ionizer Deluxe from Air Water Life is one of the bestselling water ionizers today, and it has definitely intrigued a lot of people who have never tried alkaline water before. 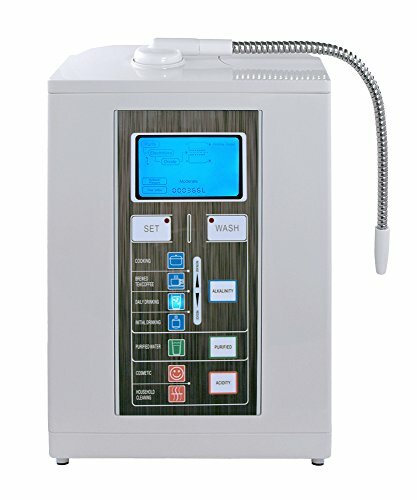 Unlike other water ionizers, however, the Ionizer Deluxe is equipped with a handful of features that make it a good choice for people who want to own a versatile water ionizer. There are multiple options here so you can have water just the way you want it, including non-ionized purified, 4 types of ionized alkaline and two ionized acidic presets. This feature set isn’t something you usually see in water ionizers so it’s definitely a plus. However, the Aqua unit has many other special features built-in as well, including the Advanced 7-Electroplate Technology, consisting of energy efficient and durable plates made of titanium that’s been coated with platinum, making it much stronger than others. The machine also has a carbon water filter that can purify more than 1,585 gallons, providing it with long life and coupled with superior technology, makes it ideal for heavy duty use. The unit is also capable of self-cleaning by way of reverse polarity. This is activated after every use and it will also engage in auto-plate every 10 and half gallons. Aside from that, the unit also has a limited lifetime warranty, backlit LCD and variable 4.5 to 11 pH. The Aqua unit also relies on superior technologies for customizing and filtering tap water pH balance. 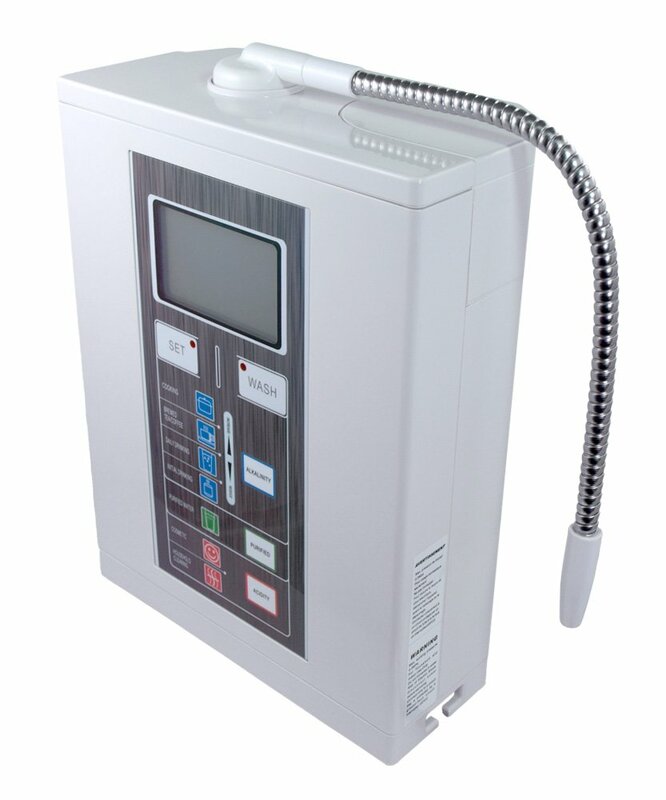 Unlike those used on other ionizers, this machine was designed to produce only clear and pure ionized water. A quick look at its feature set will show that it has many of the features you’d expect from a costly ionizer, but you can get them here and at a much lower price. The unit is a durable ionizer and it only uses components that have been approved by the FDA. In fact, every component that the ionized water goes, filters, and touches has been approved by the FDA. Aside from this, the Aqua Deluxe incorporates support for high density continuous electrolysis. Furthermore, the unit is also resistant to erosion and oxidation. Because of the design, the unit is capable of providing long life with minimal power consumption, making it economical. Another advantage of the Aqua-Ionizer Deluxe is that it automatically removes the hazardous and dangerous elements in tap water. It must be noted that its water filter is really state of the art and designed for removing VOCs, pesticides, radon, trihalomethane, chlorine, benzene and other pollutants in tap water. Moreover, the unit also is also capable of cleaning up to 6,000 litters or 1585 gallons of water. * There are multiple healthy water options, something other ionizers don’t offer. * The plates are very effective and power efficient. * The water filter is powerful and purifies well. * The self-cleaning mechanism is very convenient . * It is one of the few, if not the only one, that has FDA approved components. * Its electroplate technology provides high conductivity levels. * The Aqua-Ionizer Deluxe is economical to use. * There is a limited lifetime warranty. * With so many features, users might take some time getting used to the Aqua Ionizer Deluxe. * Dissecting the manual is quite a challenge. The vast majority of reviews online have been positive, with many commenting how easy it is to install. Other reviewers have also taken note of how good the ionized water tastes, which is actually a concern of many who have never tried ionizers before. In fact a lot of reviewers have noted how effective it can be for health conscious people especially those who are serious about taking care of their bodies. One reviewer, a kidney transplant survivor, remarked at how effective it is in keeping his body healthy. A lot of reviewers also like the fact that the unit is very affordable and has many of the features they only expected to find in more expensive water ionizers. Aside from being an effective product, what really caught a lot of people’s attention is how affordable the product and the replacement parts are compared to other products. The combination of affordability and efficiency is the reason why it has become very popular. There are a lot of water ionizers on the market and many of them are heavily promoted. The problem with most of those products is they don’t deliver on their promises. There’s also the fact that they’re expensive and difficult to use. Fortunately the Aqua-Ionizer is a notable exception. It’s not just affordable but also generally easy to use. The nice thing about the product is there are plenty of options available, something that many users will probably appreciate. While a simple and straightforward water ionizer is nice, having multiple options is nice too, and it’s not hard to avail of them here. Aside from being compact, the unit is also notable for its water filter which really works. The claim that it is capable of purifying more than 1,500 gallons is accurate, and the self-cleaning mechanism is definitely quite convenient. If those features aren’t convincing enough, then the FDA approved components and the user reviews should be more than enough to help you make up your mind. It’s very rare that one can find a product that gets as many positive reviews as the Aqua-Ionizer machine, but it should be expected given the product’s features. Aside from having state of the art features, it should also be clear that the unit was built to deliver ionized water at the highest level. Without doubt, the Air Water Life machine is a water ionizer that works. This entry was posted in Alkaline Water, Water Ionizer Reviews, Water Ionizers on June 22, 2014 by admin.